"Youchi Soga Kariba no Akebono", a katsureki-influenced jidaimono, was premiered in June 1881 at the Shintomiza [casting]. The original drama "Youchi Soga Kariba no Akebono" was in 5 acts. In the Shôgun hunting field (kariba) near Mount Fuji, The Soga brothers, Soga Jûrô Sukenari and Soga Gorô Tokimune, break into Kudô Saemon Suketsune's camp at night and with the help of a map previously supplied by a woman named Kisegawa no Kametsuru, they soon achieve their aim, which was to take Kudô's life to avenge the killing of their father. After the success of their vendetta, the brothers shout out their deed for all to hear, at which Kudô's retainers come out to attack them. 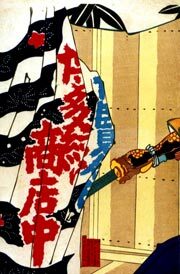 In the ensuing fight, Jûrô's sword breaks and he is killed by Nitta Tadatsune in a place called Matsu-ga-Saki. As for Gorô, he is still fighting off his adversaries while calling his brother's name. Then he hears Nitta no Shirô shouting loudly that he has killed Jûrô. Gorô then starts to head for the main camp housing the regent Minamoto no Yoritomo, in order to avenge his brother's death. Someone passes nearby, but Gorô takes it to be a woman because she has a woman's cloak over her head. However, it turns out to be, not an innocent woman, but a young warrior named Gosho no Goromaru Fuyuyasu, who accosts him. Gorô is caught unawares and is taken prisoner by the boy. The next morning after the vendetta, the assembled lords and warriors are all talking loudly about the past night's affair. Presently the ruler Yoritomo himself appears and takes his place. Soon afterwards, the youth Goromaru comes, holding the rope by which Gorô is bound. Some of the men criticize this, saying that Goromaru need not lead the prisoner himself, as surely there are other men he could command for the duty. But Goromaru says that the prisoner is of good family and possessed of a valor that deserves all courtesy even as a prisoner. Yoritomo takes the same attitude and demands to lay out a boarskin rug (shikigawa) for the prisoner. Then he questions Gorô on the night before, inquiring about the manner in which each of the leading warriors killed in the fray had met his death in the fight with the brothers. This is Gorô's monogatari. After hearing how Jûrô and Gorô had fought so bravely against Kamakura's finest warriors, Yoritomo craftily asks how it could be then that Gorô was taken prisoner by such a slight boy as Goromaru. Gorô replies that he and his brother had agreed not to harm any women or children in the fight and that he had taken Goromaru for a woman because of the disguising woman cloak he had worn. Presently Nitta, on Yoritomo's orders, comes bearing the head casket (kubioke) containing Jûrô's decapitated head. The purpose is to allow Gorô a last farewell with his brother. Gorô's ropes are unbound as the casket is brought before him. At the sight of his brother's head, Gorô breaks down and weeps. Nitta recounts the tale of the fight in which he killed Jûrô, modestly saying that he has won only because Jûrô's sword had accidentally broken off at the hilt. As proof, the broken sword is presented. 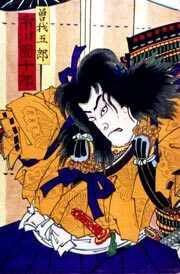 Inubômaru, the little son of Kudô comes in with a whip and strikes Gorô, but is reprimanded by Kajiwara Kagetoki for acting so wildly in front of the lord Yoritomo. At first Gorô shows anger, frightening the boy. But when Gorô learns that the boy is Suketsune's son, he urges the boy to beat him as much as he likes. Inubômaru, in the face of such a noble attitude, finds it difficult to keep up his anger and asks Gorô to take a more arrogant attitude. Gorô complies, and the boy hits him with the whip. Kajiwara Kagetaka urges the boy to ask Yoritomo that Gorô be sentenced to death. But Yoritomo replies, saying that he plans to pardon Gorô and even give him a fief estate. However, Gorô says that he must go and join his brother who is no doubt waiting for him in the afterlife, and refuses the pardon. Yoritomo had thought such would be the case, so he calls now for a court order that he had prepared the night before. In this document, the mother of the two brothers, is awarded a small fief, much to Gorô's amazed gratitude. 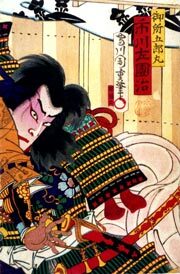 Then Yoritomo himself, as a mark of the esteem he holds for the valiant prisoner, personally rebinds him with a silken cord. He also declares that he will honor Gorô by executing him with his own hand.